I spotted this interesting looking beer in a local Mine Mart. Neither Rob nor I knew anything about Tama no Megumi Japan Beer, which is not a surprise for me but my jaw hit the tatami when Rob didn’t have a clue either. According to the back of the bottle – always a good place to look – the brewery, Ishikawa, first brewed with this recipe in 1887, and named it “Japan Beer”. It was the middle of the Meiji era craft beer boom, during which time 150 to 200 breweries opened up in Japan. Tama no Megumi Japan Beer is top fermented, meaning it uses higher-temperature ale yeasts. 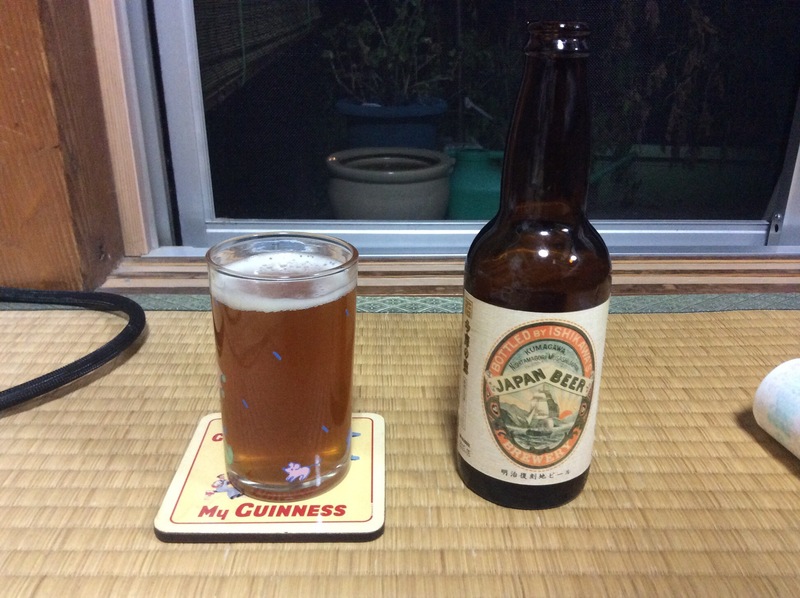 A mystery beer from Kanagawa. Tama no Megumi Japan Beer glugs it way out of the bottle cloudily and with a little head clinging to the rim. The nose is interesting; initially light and floral, it gives way to hay, fruity, and wheaty notes. It brings to mind a witbier such as Coronado’s Orange Avenue Wit, one of my favourite beers. Tama no Megumi Japan Beer has a mildly bitter taste alongside the complicated, fruity mouth feel, and the aftertaste doesn’t stick around. If you can find this blast from the past, you’ll enjoy its interesting nose and complex flavour. I couldn’t find it anywhere on the website though. Tama no Megumi Japan Beer can be bought online at the Ishikawa Brewery store here. Else, it is an obscure beer to find. I managed to get a bottle of this from my recent trip to the Ishikawa Shuzo brewery and have to say, I quite enjoyed it. It’s definitely got an interesting musty aroma to it along with a mild bitter taste. I guess my bottle was perhaps fresher than Joe’s as the bitter, fruity taste lasted much longer than I thought it would have done. A nice find. is this not just the bottle conditioned pale ale with a different label? some breweries do that (contract brewing etc). It seems that that they are different beers according to Ishikawa Brewery but I will double-check with them and merge in case.